Once a re-fluxing vein is identified in a symptomatic patient, the problematic vein often needs to be removed from circulation. Traditionally, this was achieved with vein stripping which involved a major surgical procedure and significant recovery time. With advances in minimally invasive technology, venous ablation can achieve the same results with minimal risk and recovery time. In addition, this procedure can be covered by health insurance companies. After cleaning the patient’s skin and appropriate sterile setup, the problematic vein is again identified using the ultrasound machine. A small needle and wire and then inserted into the vein after applying local anesthetic. This access point is then used to introduce the Venefit ablation catheter into the vein. 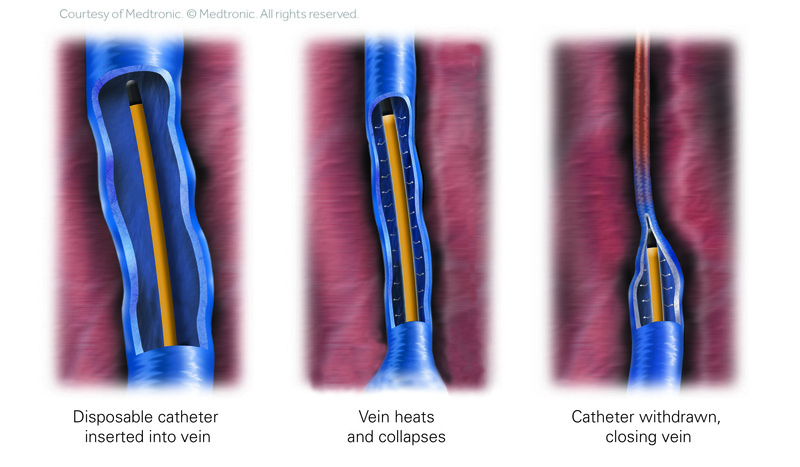 After confirming appropriate positioning of the catheter, the entire length of the treated vein is anesthetized using a special solution injected under the skin. 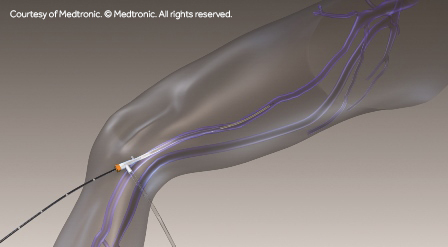 The Venefit ablation catheter is delivers radiofrequency energy (RF) which essentially heats the vein wall. As the thermal energy is delivered, the vein wall will shrink and seal closed. This will allow re-routing of the blood to healthy veins. Following the procedure, a simple bandage will be placed over the insertion site and compression stockings will be placed on your leg. Most patients return to normal activity right away, though we ask that you do not over exert yourself for a few days. Depending on your daily activity level, we may discuss a few days off work or exercise when we meet for the initial consultation.